Founded in 2006, Mulesoft is an 850 person company based in San Francisco that builds data integration tools. The company started originally as an open-source product and then focused on its paid offering. Today, the business generates nearly $200 million annually in revenue, and is growing at 70%. The business filed to go public last week, and the documents reveal a very impressive business operating at scale. The chart above shows the subscription revenue is roughly at $150 million and professional services revenue is about $35 million this year. Growing quickly at the scale is no mean thing. 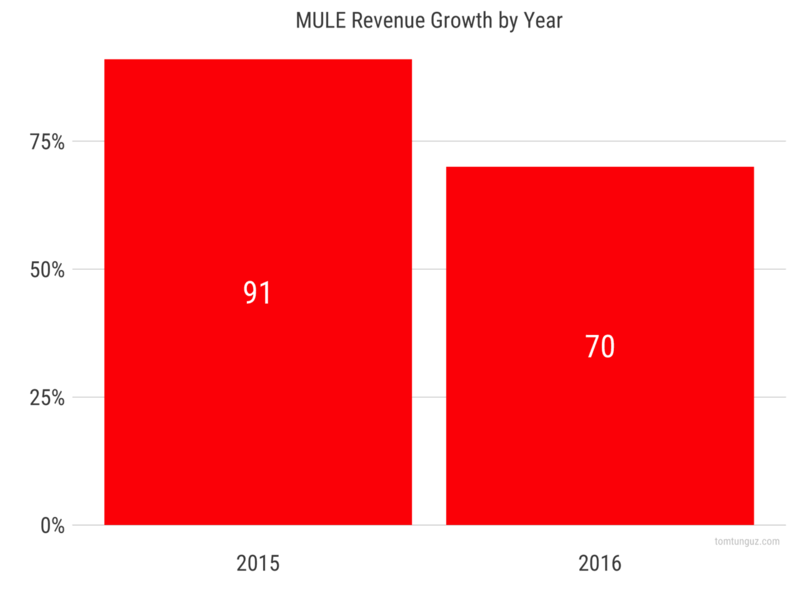 In 2015, Mulesoft grew 91% and in 2016 the business grew 71%. There are three contributors to this growth. First, the number of customers grew from 592 to 839 to 1071 over the last three years. Second, new customer contract value has more than doubled from $77,000 in 2014 to $169,000 in 2016. 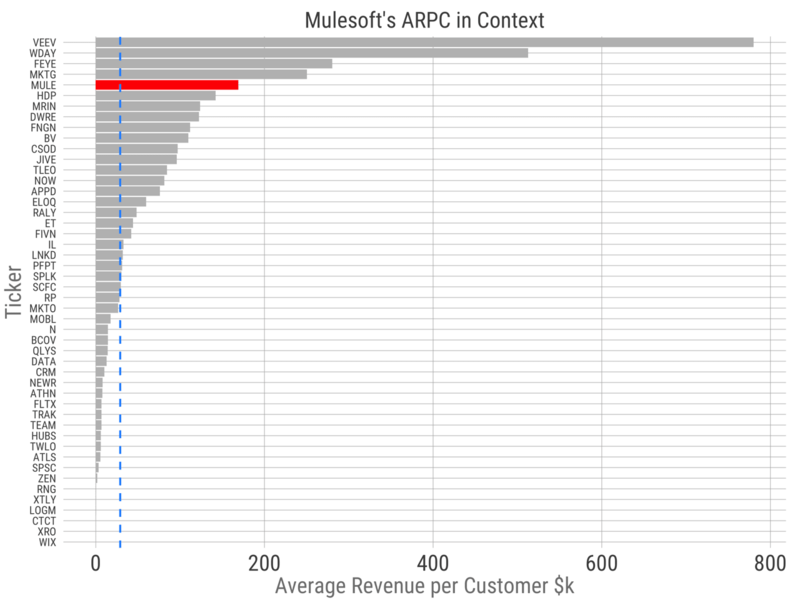 Mulesoft prices is a function of the amount of computation power charged by customers and this doubling of average contract size suggests the sales team is able to convince customers to buy more of the software at the outset. There is less of an argument to be made that the company is moving upmarket as it has sold to enterprise customers for a long time. 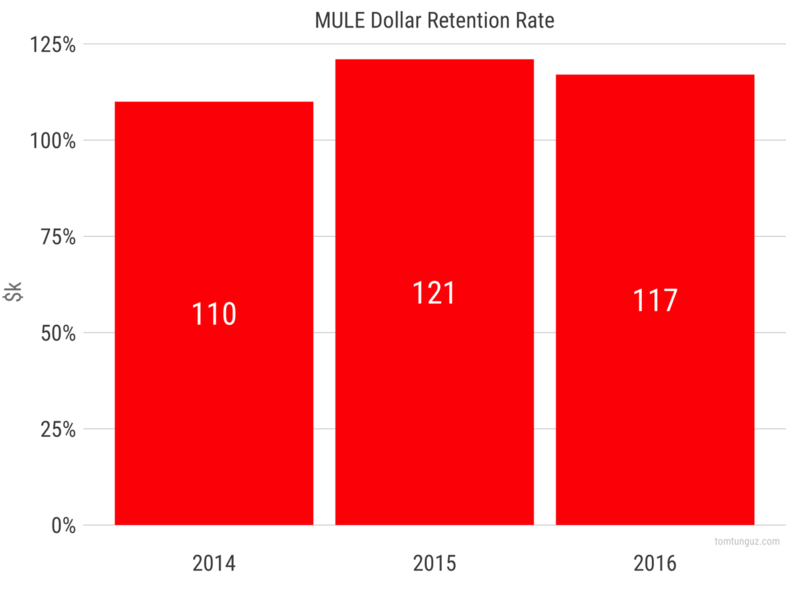 Third, Mulesoft boasts great dollar retention that has grown from 110% to 117% over the last years. This dollar retention metric compares favorably to other public traded software companies like Box and ServiceNow, whose dollar retention is in a similar ballpark. 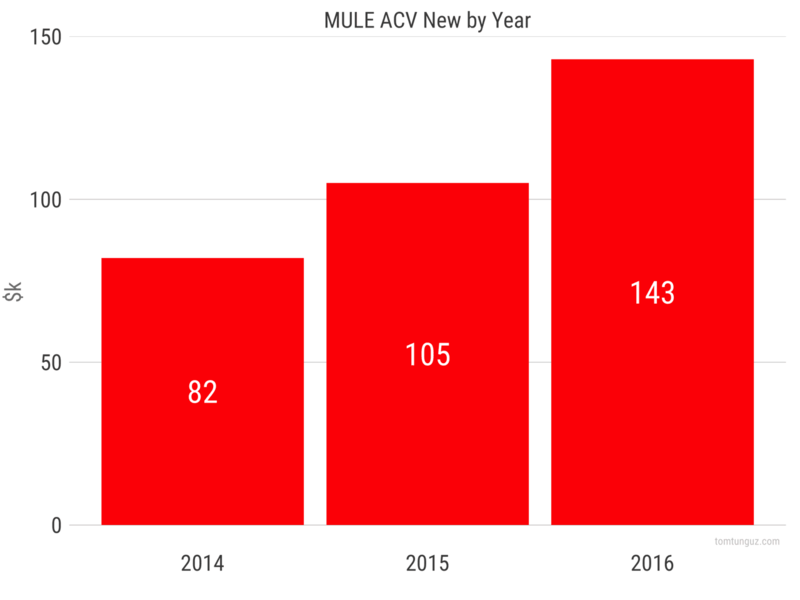 Mulesoft average contract value for new customers is $169,000 which places it as the fifth-largest for any publicly traded software company that has filed an S-1. In terms of gross margin, the business is operating at about 74%, is better than the public software average of 71%. Professional services margins used to be -25%, but the company has brought that figure up to breakeven in the last year. This may also be a contributing factor to the increase in average contract value. 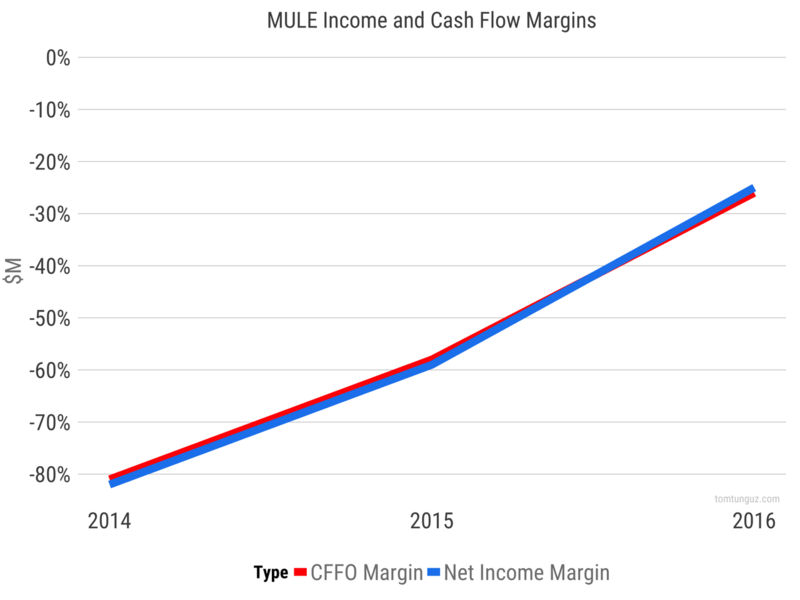 Mulesoft is rapidly approaching cash flow from operations breakeven and net income profitability. Cash flow from operations breakeven means the business generates as much cash as it consumes setting aside financing and investing activities. 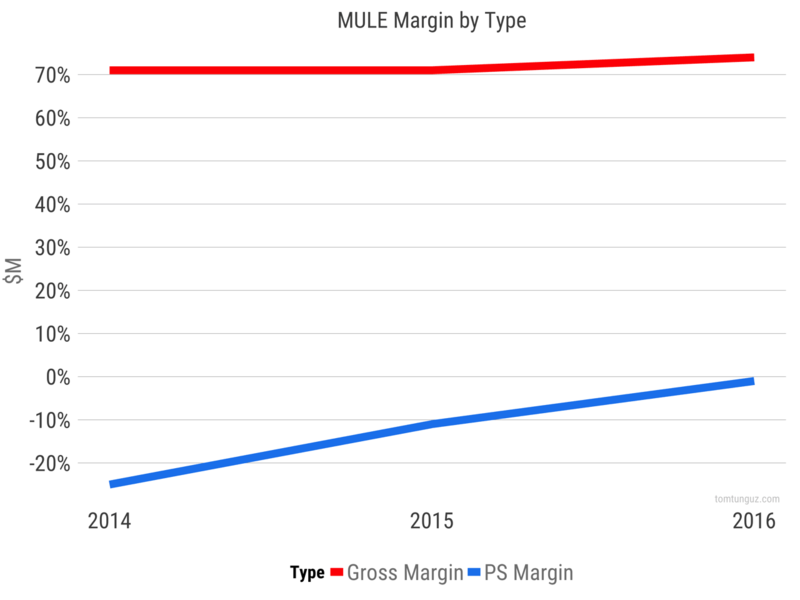 Mulesoft operated with a estimated sales efficiency of 0.57 in 2015 and a estimated sales efficiency of 0.63, which implies a payback period of 19 months, right on the average. The business has raised $259 with $103 million remaining on the balance sheet. To compare this figure with similar companies, AppDynamics has raised $364 million, Workday has raised $175 million, and that the bottom end of the spectrum, ServiceNow raised $84 million. Mulesoft is an incredible company. To be growing at 70% while generating more than $150 million in revenue is an incredible accomplishment. 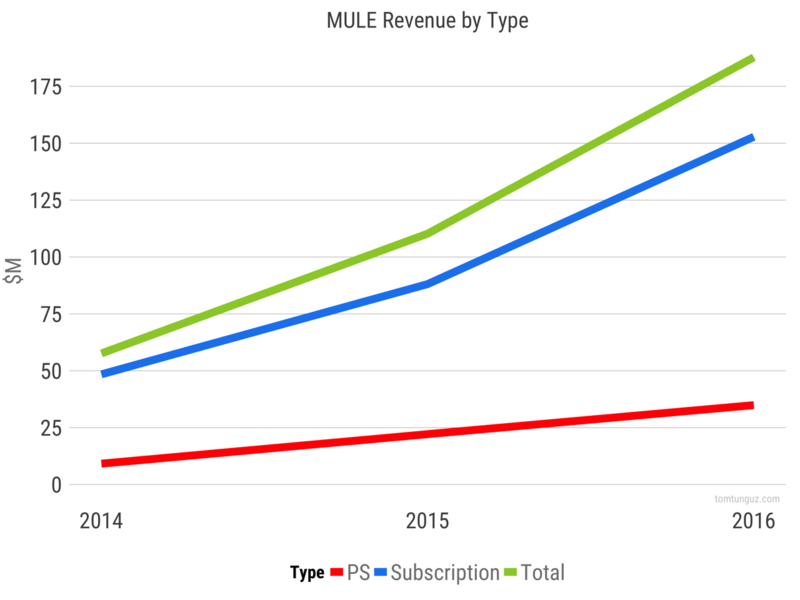 The other metrics of the business are right in line with the rest of the market, and suggest Mulesoft will be an important business for a long time to come.